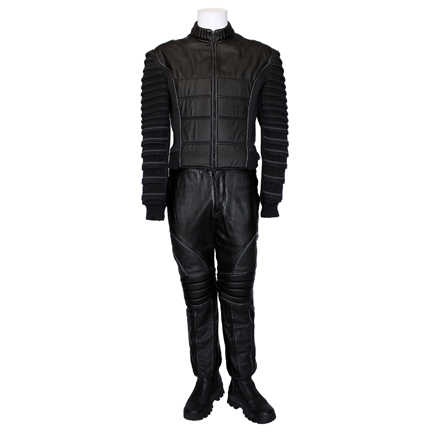 This complete costume was worn by the character “Gabriel Yulaw” portrayed by actor Jet Li in the 2001 motion picture “The One”. 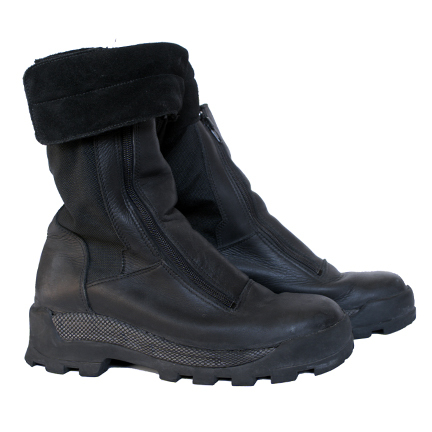 The costume consists of a black and grey vinyl jacket with banded cloth sleeves, matching pants, and pair of GBX black boots. 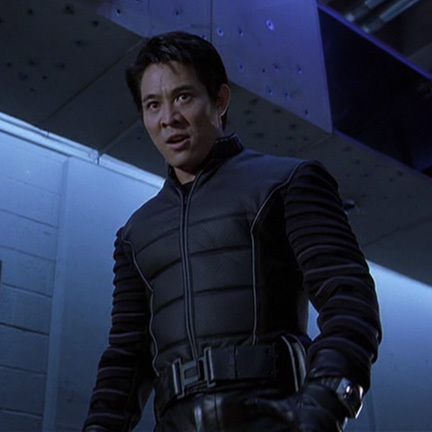 The jacket and pants were custom made for Mr. Li’s use on the film. 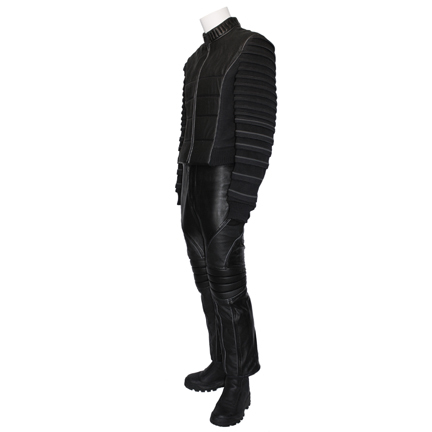 This outfit was worn in the opening sequence of the film when Yulaw shows up at a futuristic prison in the Anubis Universe in order to murder his alternate reality double “Lawless” (also played by Li). 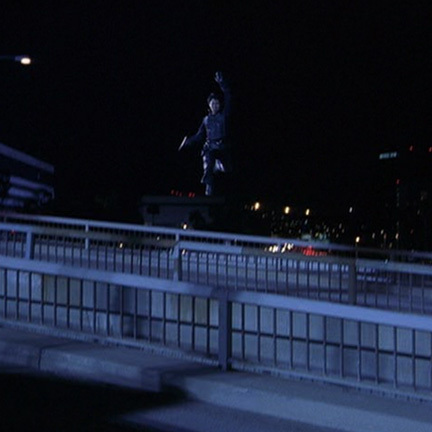 After killing Lawless and battling police, Yulaw is chased and performs superhuman feats of agility before eventually being captured by two policemen from his own universe/timeline. 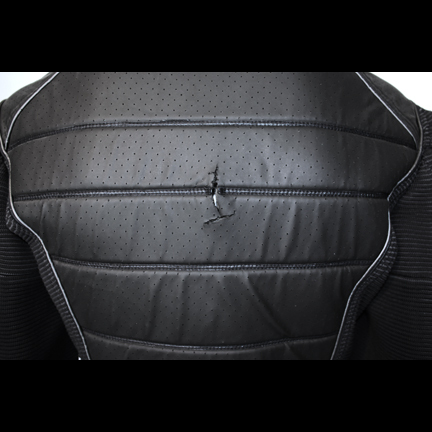 This outfit has three small holes cut into the back and sides of the waistline for use with a wire harness during Mr. Li’s aerial stunt sequences, such as when Yulaw runs across walls and leaps across the freeway overpass. Like many martial artist actors, Mr. Li performed his own stunts during filming, and the interior of the wardrobe has “Stunt Only, W/out Pads” handwritten in white ink. The interior of both boots has the character name “Yulaw” handwritten in white ink. 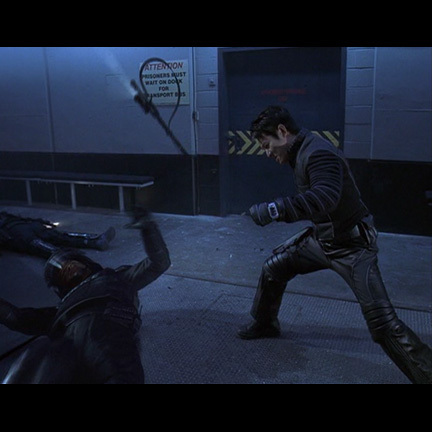 “The One” received a nomination for Best Science Fiction Film from the Academy of Science Fiction, Fantasy, and Horror Films, and an MTV Movie Award nomination for Best Fight for one of the extended martial arts sequences where Li appears to fight an alternate version of himself. 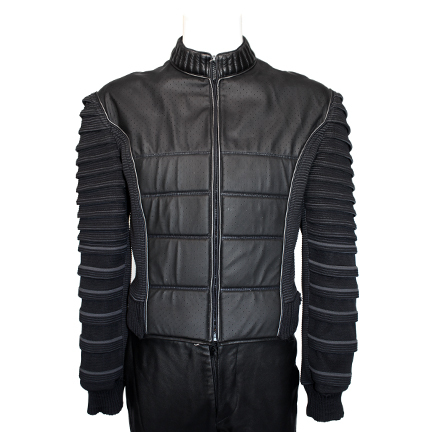 The outfit is in good screen used condition with minor evidence of wear from its use in the action sequences. Accompanied by a letter of authenticity. Presented by The Golden Closet, your premier source for iconic screen used movie wardrobe, props, and collectible music entertainment memorabilia.